Really, the only prerequisite for camp is to come prepared to train and have a great camp experience. When runners come with such an open mind, they will be able to take in all of the adventures, the trips, the wonder that the Rockies have to offer. As far as training goes, it is recommended that the boys be prepared to run approximately 50 miles during the week (40-70) and the girls 40 miles (30-50). Veteran varsity runners may be running 70. At any rate, plan your summer training so that you can have several weeks of 40-50 miles prior to camp. And, during August, do incorporate a couple of morning runs into your weekly regimen. Nobody wants to get injured and nobody wants to miss the great running opportunities this camp has to offer! For the above reasons, this camp is for those high school boys who have had experience running cross country or distance events and who welcome the challenges training at altitude brings. There are a few other specific requirements for this running camp.Most of them are customary - nothing extraordinary. Registration, medical and waiver forms need to be submitted along with the deposit to begin your process. A copy of a recent Medical Examination is required. 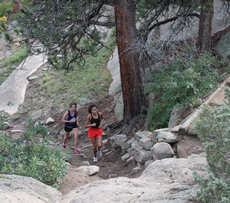 You need to be in decent shape for the rigors of cross country at altitude. 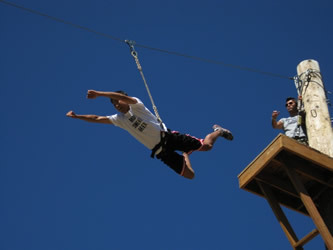 We recommend a minimum of 40 miles per week in the weeks leading up to camp. Veterans may run 60-70 while in camp. Younger and less experienced runners may run 40. Still, if you want to have a great experience, come prepared!